Click on specific names on the left to view a quick-facts report on individual drugs. ​This chart shows the top substances of abuse in the Southwest Five Counties of Utah (Washington, Garfield, Beaver, Iron and Kane), and the trend pattern of youth use from 2007 to 2015. The data is an average of all grades, 6-12th. The first thing you should note when looking at this chart is that drug use rates are low in Southern Utah. Even our most widely used drugs are still being used by less than 10% of kids on a regular basis. Most kids don't use drugs. Nicotine: As the chart demonstrates, the most common drug of abuse among Southern Utah youth is nicotine, inhaled through electronic cigarettes or vaporizers. Nicotine use has skyrocketed more than 300% just in the last two years! Alcohol: Though alcohol use rates have continually dropped overall since 2007, we saw a slight increase in use from 2013-2015. Traditionally, alcohol was always the most common drug abused in Southern Utah, until 2015, when nicotine through E-Cigarettes far surpassed it, and the increase in marijuana threatens to reach or pass alcohol use as well. 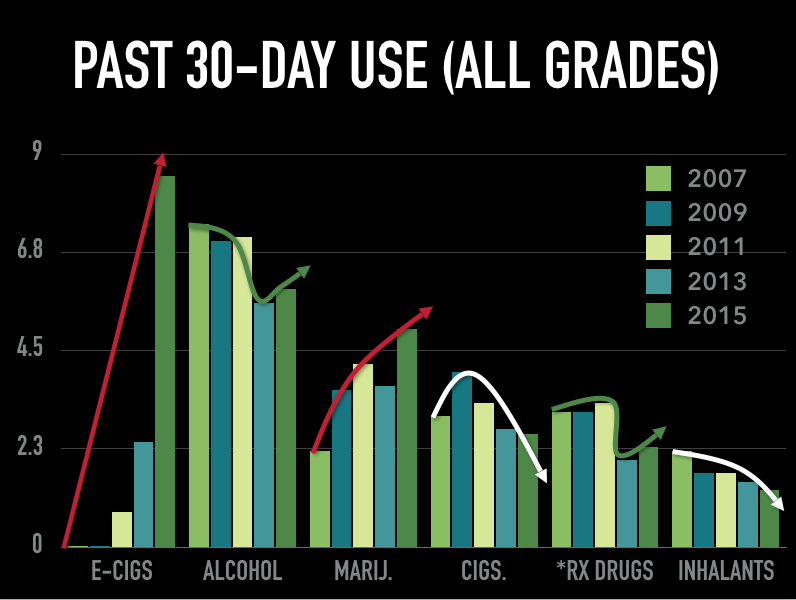 Marijuana: Marijuana use has continually increased since 2007. Changes in perception of the dangers and harms of this drug have given youth a relaxed attitude about marijuana, and they are using more than we have seen in the past. In some Southern Utah communities, more youth smoke marijuana than drink alcohol. And in almost all of our communities, more youth smoke marijuana than tobacco. Tobacco Cigarettes: Traditional tobacco cigarette use has been on a steady decline in Southern Utah. However, new research shows that "21.5% of Utah youth who tried e-cigs reported that they smoked regular cigarettes for the first time after starting with e-cigs," (Utah Department of Health, 2012), meaning that e-cigs or vaporizers are a new gateway to traditional cigarettes. So use rates may rise. Prescription Drugs: Although prescription drug abuse has dropped in many of our counties, in some locations certain prescription drug abuse continues to rise. For example, prescription narcotics (pain relievers) are abused less than they were six years ago, but prescription stimulants (like ADHD and asthma medications) and sedatives (like sleeping pills and anxiety medications) are abused more. Inhalants: Though the chart above shows that inhalant use is very low, when looking at specific grade levels rates can jump significantly. 8th graders abuse inhalants more than any other grade. In some schools in Southern Utah, inhalant rates among 8th graders are at nearly 10%. This age group seems to be especially vulnerable when they have access to these products.